DERELI, G. , EYECIOGLU, O. , MISIRLIOGLU, B. S.
In this work, we have examined how the multi-vacancy defects induced in the horizontal direction change the energetics and the electronic structure of semiconducting Single-Walled Carbon Nanotubes (SWCNTs). The electronic structure of SWCNTs is computed for each deformed configuration by means of real space, Order(N) Tight Binding Molecular Dynamic (O(N) TBMD) simulations. Energy band gap is obtained in real space through the behavior of electronic density of states (eDOS) near the Fermi level. Vacancies can effectively change the energetics and hence the electronic structure of SWCNTs. In this study, we choose three different kinds of semiconducting zigzag SWCNTs and determine the band gap modifications. We have selected (12,0), (13,0) and (14,0) zigzag SWCNTs according to n (mod 3) = 0, n (mod 3) = 1 and n (mod 3) = 2 classification. (12,0) SWCNT is metallic in its pristine state. The application of vacancies opens the electronic band gap and it goes up to 0.13 eV for a di-vacancy defected tube. On the other hand (13,0) and (14,0) SWCNTs are semiconductors with energy band gap values of 0.44 eV and 0.55 eV in their pristine state, respectively. Their energy band gap values decrease to 0.07 eV and 0.09 eV when mono-vacancy defects are induced in their horizontal directions. Then the di-vacancy defects open the band gap again. So in both cases, the semiconducting-metallic - semiconducting transitions occur. It is also shown that the band gap modification exhibits irreversible characteristics, which means that band gap values of the nanotubes do not reach their pristine values with increasing number of vacancies. S. Iijima and T. Ichihashi, "Single-shell carbon nanotubes of 1-nm diameter," Nature, vol. 363, no. 6430, pp. 603605, 1993. P. Avouris, Z. Chen, and V. Perebeinos, "Carbon-based electronics," Nat Nano, vol. 2, no. 10, pp. 605615, Oct. 2007. C. Dekker, "Carbon Nanotubes as Molecular Quantum Wires," Phys. Today, vol. 52, no. 5, pp. 2228, 1999. T. W. Ebbesen and T. Takada, "Topological and SP3 defect structures in nanotubes," Carbon N. Y., vol. 33, no. 7, pp. 973978, Jan. 1995. A. Hashimoto, K. Suenaga, A. Gloter, K. Urita, and S. Iijima, "Direct evidence for atomic defects in graphene layers.," Nature, vol. 430, no. 7002, pp. 870873, Aug. 2004. J. A. Rodriguez-Manzo and F. Banhart, "Creation of individual vacancies in carbon nanotubes by using an electron beam of 1? Å diameter," Nano Lett., vol. 9, no. 6, pp. 22852289, 2009. A. Tolvanen, G. Buchs, P. Ruffieux, P. Gröning, O. Gröning, and A. V Krasheninnikov, "Modifying the electronic structure of semiconducting single-walled carbon nanotubes by Ar+ ion irradiation," Phys. Rev. B, vol. 79, no. 12, p. 125430, Mar. 2009. J. A. Robinson, E. S. Snow, S. C. Badescu, T. L. Reinecke, and F. K. Perkins, "Role of Defects in Single-Walled Carbon Nanotube Chemical Sensors," Nano Lett., vol. 6, no. 8, pp. 17471751, Aug. 2006. 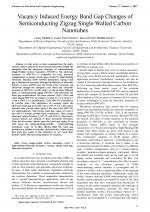 M. K. Kostov, E. E. Santiso, A. M. George, K. E. Gubbins, M. B. Nardelli, "Dissociation of Water on Defective Carbon Substrates," Phys. Rev. Lett., vol. 95, no. 13, p. 136105, Sep. 2005. L.-G. Tien, C.-H. Tsai, F.-Y. Li, M.-H. Lee, "Band-gap modification of defective carbon nanotubes under a transverse electric field," Phys. Rev. B, vol. 72, no. 24, p. 245417, Dec. 2005. Y. V Shtogun, L. M. Woods, "Electronic and magnetic properties of deformed and defective single wall carbon nanotubes," Carbon N. Y., vol. 47, no. 14, pp. 32523262, Nov. 2009. H. Zeng, J. Zhao, H. Hu, J.-P. Leburton, "Atomic vacancy defects in the electronic properties of semi-metallic carbon nanotubes," J. Appl. Phys., vol. 109, no. 8, 2011. G. Kim, B. W. Jeong, J. Ihm, "Deep levels in the band gap of the carbon nanotube with vacancy-related defects," Appl. Phys. Lett., vol. 88, no. 19, 2006. S.-H. Jhi, "An ab initio study of the electronic properties of carbon nanotubes activated by hydrogen-passivated vacancies," Carbon N. Y., vol. 45, no. 10, pp. 20312036, Sep. 2007. L. V. Liu, W. Q. Tian, Y. A. Wang, "Ab initio studies of vacancy-defected fullerenes and single-walled carbon nanotubes," Int. J. Quantum Chem., vol. 109, no. 14, pp. 34413456, 2009. Q.-X. Zhou, C.-Y. Wang, Z.-B. Fu, Y.-J. Tang, H. Zhang, "Effects of various defects on the electronic properties of single-walled carbon nanotubes: A first principle study," Front. Phys., vol. 9, no. 2, pp. 200209, 2014. J. Kotakoski, A. V Krasheninnikov, K. Nordlund, "Energetics, structure, and long-range interaction of vacancy-type defects in carbon nanotubes: Atomistic simulations," Phys. Rev. B, vol. 74, no. 24, p. 245420, 2006. L.-G. Tien, C.-H. Tsai, F.-Y. Li, M.-H. Lee, "Influence of vacancy defect density on electrical properties of armchair single wall carbon nanotube," Diam. Relat. Mater., vol. 17, no. 45, pp. 563566, Apr. 2008. Y.-J. Kang, Y.-H. Kim, K. J. Chang, "Electrical transport properties of nanoscale devices based on carbon nanotubes," Curr. Appl. Phys., vol. 9, no. 1, Supplement, pp. S7S11, Jan. 2009. V. V Belavin, L. G. Bulusheva, A. V Okotrub, "Modifications to the electronic structure of carbon nanotubes with symmetric and random vacancies," Int. J. Quantum Chem., vol. 96, no. 3, pp. 239246, 2004. C. Ozdogan, G. Dereli, T. Çagin, "O(N) parallel tight binding molecular dynamics simulation of carbon nanotubes," Comput. Phys. Commun., vol. 148, no. 2, pp. 188205, 2002. G. Dereli, C. Ozdogan, "O(N) algorithms in tight-binding molecular-dynamics simulations of the electronic structure of carbon nanotubes," Phys. Rev. B, vol. 67, no. 3, p. 35415, 2003. G. Dereli, C. Ozdogan, "The Structural Stability and Energetics of Single-Walled Carbon Nanotubes under Uniaxial Strain," Phys. Rev. B, vol. 67, p. 0354416, 2003. G. Dereli, B. Sungu, "Temperature dependence of the tensile properties of single-walled carbon nanotubes: "O(N) tight-binding molecular-dynamics simulations," Phys. Rev. B, vol. 75, no. 18, p. 184104, May 2007. G. Dereli, B. S. Misirlioglu, O. Eyecioglu, and N. Vardar, "A new lower limit for the bond breaking strains of defect-free carbon nanotubes: Tight binding MD simulation study," Comput. Mater. Sci., vol. 69, pp. 234242, Mar. 2013. G. Dereli, B. Sungu, and C. Ozdogan, "Thermal stability of metallic single-walled carbon nanotubes: an O( N ) tight-binding molecular dynamics simulation study," Nanotechnology, vol. 18, no. 24, p. 245704, 2007. L. Colombo, "Tight-Binding Molecular Dynamics,", Annual Reviews of Computational Physics IV, 1996, pp. 147183. L. Colombo, "A source code for tight-binding molecular dynamics simulations," Comput. Mater. Sci., vol. 12, no. 3, pp. 278287, Oct. 1998. C. H. Xu, C. Z. Wang, C. T. Chan, and K. M. Ho, "A transferable tight-binding potential for carbon," J. Phys. Condens. Matter, vol. 4, no. 28, p. 6047, 1992. P. Ordejon, "Order-N tight-binding methods for electronic-structure and molecular dynamics," Comput. Mater. Sci., vol. 12, no. 3, pp. 157191, 1998. D. R. Bowler, M. Aoki, C. M. Goringe , A.P. Horsfield and D.G. Pettifor, "A Comparison of Linear Scaling Tight-Binding Methods", Modelling Simul. Mater. Sci. Eng.,5: 199-222,1997. W. Yang, "Direct calculation of electron density in density-functional theory," Phys. Rev. Lett., vol. 66, no. 11, pp. 14381441, Mar. 1991. L. Verlet, "Computer "Experiments" on Classical Fluids. I. Thermodynamical Properties of Lennard-Jones Molecules", Physical Review 159: 98103, 1967. 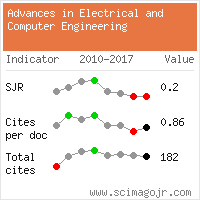 Citations for references updated on 2019-04-21 01:13 in 242 seconds. Website conception, design and maintenance by Eugen COCA. Content updated on 28 Feb 2019. Site engine updated on 28 Feb 2019. This page was generated on the server in 0.112 seconds and loaded in your browser in > seconds.